The signal source for MR imaging are exclusively the hydrogen nuclei of water and fat molecules. In contrast, MR spectroscopy (MRS) allows for the investigation of additional atomic nuclei, provided that these possess an uneven number of protons or neutrons or of both. Nuclei of interest for metabolic MRS studies are shown in Table 25.1. Particularly important are the nuclei 1H (protons from metabolites other than water and fat molecules), 13C, 19F, 23Na, 31P, 39K and 87Rb. 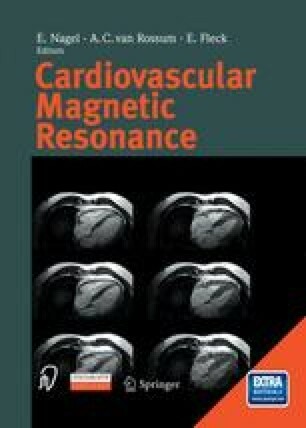 In principle, a large number of clinical questions could be addressed with cardiac MRS. The main limitation of the method, however, is its low sensitivity of signal detection: MRS-detectable atomic nuclei have a substantially lower intrinsic MR sensitivity than 1H, and, in addition, they are present in concentrations several orders of magnitude lower than those of water and fat 1H molecules.